Well, girls. The time has come. 2016 is a few days away. And you know what that means? It’s the time of year where we all get to make lists of our New Year’s Resolutions — those goals and changes we hope to make and keep throughout the next year only to forget most all of them by March 2016. Am I right? 😉 Well hopefully not for all of you. But I know for me, I cannot remember the bulk of my resolutions from the past three years. If you can, I am impressed and you don’t need to read this article. Instead, just pass it on to someone like me because there are plenty of us — the Washington post ran an article stating 25% of the nearly 45-50% of Americans who make resolutions don’t keep them more than 7 days. But just because so many of us don’t follow through with our resolutions doesn’t mean we don’t have the best intentions. And it doesn’t mean that we don’t want to make change. It just means that sometimes we don’t know the best ways to do so. So today I am here to offer you tips to keep your resolutions! So next year at this time you can look back and tell me not only what your resolution was but how much progress you’ve made with it. 1. Pick one specific resolution that is not overly broad. (Two at the most.) And forget about the rest of the other things you’re tempted to list. Stop using the F word … etc. etc. etc. Making long lists of resolutions is setting yourself up to fail because it is very difficult for one person to make major changes to several areas of their life all at once (while still working, raising kids, etc.) So this year before New Year’s Eve, reserve a little time to yourself to ponder what you actually want to change in 2016. Take a warm bath, go on a 30-minute walk alone or turn off the music on your drive home and just think! What change are you most motivated to make? What change is most needed and beneficial for you and others around you? Then let that be your resolution for this year. 2. Make the resolution as specific as possible then create a plan detailing how you will accomplish it. So now that you’ve narrowed it down to your final choice, it’s time to get specific with it. Instead of generically saying: “Start eating healthy.” Try saying: “Eliminate processed desserts from my diet including Snickers bars and Littles Debbie’s and replace with at least two pieces of organic fruit each day. Or instead of saying: “Do more laundry.” Try “Do kids’ sheets on the first and fourth Sundays of the month and adults on the opposite Sundays. Do a load of clothes and towels on Monday, Wednesday and Saturday. Once you’ve specified the goal, it’s time to detail your plan for accomplishing it. Why go this far? Well, once you’ve already taken time to outline all of the specifics, excuses begin to fall away and follow-through becomes easier. Buy baskets for each child’s room. Have kids bring laundry down on Sunday, Tuesdays and Saturdays before bed. Start load of laundry before shower on Monday, Wednesdays and Saturdays. Put in dryer before leaving the house. Have kids help put away during story time. 3. Write an essay to yourself on why you want to make this change. In the passion of the moment, it’s easy to explain why we chose this resolution, but as time passes, our passion can fade. In order to really make change, our minds have to be committed to it. And the best way to build mental strength and commitment is to think thoughts that keep you committed, which is why an essay on why you want to make change comes in handy. The more you read it, the stronger you stay. It’s like creating ruts of commitment in your mind. And every time you read it, the ruts get deeper. You can commit to read the essay once a week over the next year, once a month or whatever you think will keep you most accountable. I recommend weekly! 4. Come up with crisis plan for scenarios where you will be weak or want to break. One of the most important steps for staying strong in change is thinking through scenarios where you will be weak and creating a plan for overcoming that weakness. One of my favorite tactics for doing this is by creating a list of temptations and then mentally rehearsing how you will deal with that temptation. Temptation: I will want to cheat on my healthy eating when I’m at girl’s night by consuming too many calories through alcohol. How I Will Defeat This: I will drink a large glass of water before I go, consume one alcoholic beverage and drink a diet sparkling drink after I finish. The more scenarios you rehearse, the stronger you will become! 5. Create daily and monthly forms of accountability. Lastly, stay accountable. 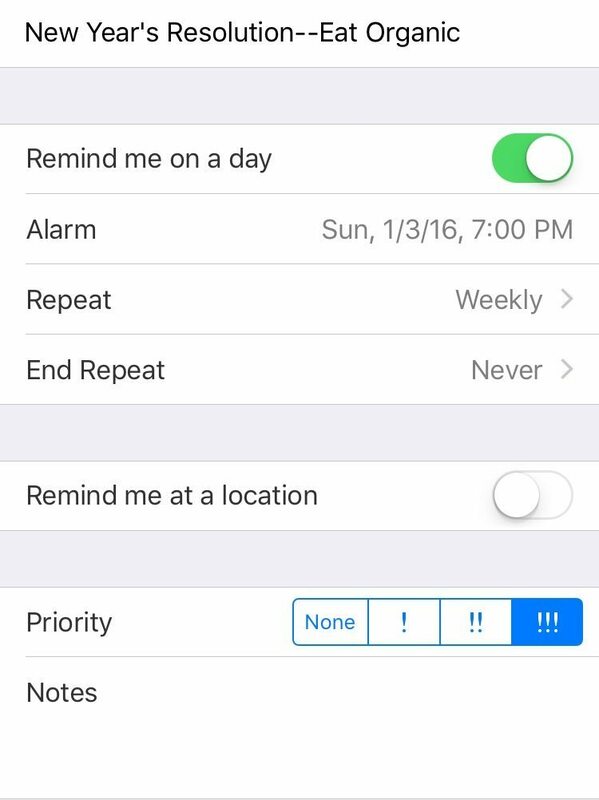 Create an alarm on your phone that reminds you every morning to stay strong. Maybe include your personal mission statement in your notes and read it weekly as mentioned above. Additionally, pick an accountability partner to meet up with or talk with at least monthly on how you are following through on your resolution. Make this person be someone who is also trying to follow through on a similar goal. Just knowing you have someone that is going to ask you about your commitment is enough motivation for many to keep it up! Cheers to Making a Resolution this Year that You will Keep! I know you can do it!